How confident should you be in the health of your smile at this moment? While the absence of symptoms can make it seem like your teeth are in good shape, you may not realize when a cavity first starts forming. Unfortunately, it is possible for a cavity to escape your notice, and continue to do harm to your enamel. Fortunately, this is the kind of issue that your Allen, TX dentist’s office can spot during a routine dental exam. During these exams, your teeth and periodontal tissues are being carefully reviewed for any possible concerns. Early detection can result in the early treatment that limits the overall impact of a dental problem on your smile. This is important, as a cavity’s effects are permanent, and the damage is irreversible. Thanks to advanced imaging tools, your dentist can improve on your chances for having problems identified in their earlier stages. Digital x-rays create close, clear pictures of your smile, and they can give your dentist a chance to spot otherwise hard-to-see problems. 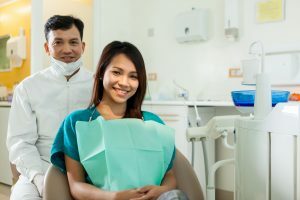 Once these issues are recognized, you can find out what kind of restorative dental work might be needed to address the matter. In addition to a close examination, your smile receives a thorough professional cleaning during preventive visits. These cleanings can lead to the important removal of tartar, which can remain even as you brush and floss. If you fail to address tartar after this substance has formed, you are more likely to experience trouble with tooth decay, and gum disease. If you want to make sure your smile is in good health, talk to Allen Family Dental about scheduling a routine dental exam and cleaning. At every appointment, you can receive thorough support, so that your smile is defended against a range of oral health threats. To plan your consultation with Dr. Torrens-Parker or Dr. Lizardi, call Allen Family Dental in Allen, TX, today at (469) 342-6644. Located in Allen, we also proudly work with patients from Frisco, Plano, McKinney, Fairview, and all surrounding areas.